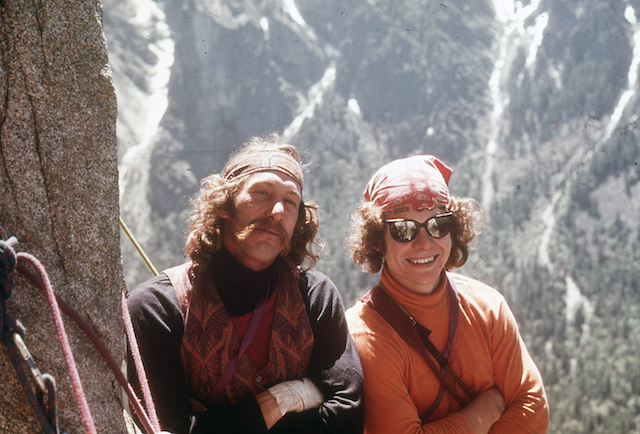 On February 16, Jim “The Bird” Bridwell, captain of numerous El Cap voyages of physical and psychological expansion, inventor, writer, thinker and fashion setter died of complications from hepatitis C. He was 73. 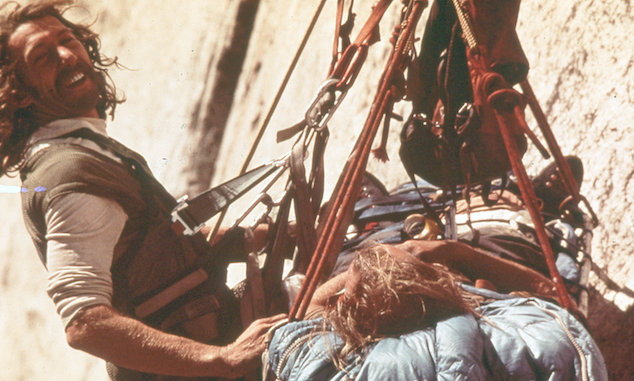 Bridwell on his first rescue with the newly founded Yosemite Search and Rescue, in 1970. I last saw Bridwell five years ago at the Ouray Ice Festival. Bridwell reached into a pocket and slung out a junkyard of gear, the fruit of an ever-evolving vision he had had about 30 years ago when he sawed one arm off of an anchor-shaped nut, the Chouinard Crack-N-Up, to make a micro pin for times when the RURP was just too big. Bridwell was a tinkerer. He looked for an edge. A sliver of creativity occupied his mind like a burst of light through a cracked door. There was the rock shoe with a swim-fin toe for slotting into thin cracks. It was beautiful except when there wasn’t a crack. Another invention, the chalkbag, found greater popularity. Paisley shirts set off with a colorful bandana had their turn, too. The handlebar moustache would have caught on, but no one else could grow one like him. Bridwell materialized in Yosemite in the early 1960s when the establishment of Robbins, Harding, Pratt, Sacherer, Et al., were still making hay, but were soon to split, having grown up or died. The Bird inherited the kingdom and decreed a new game, free climbing. The throne fit him. 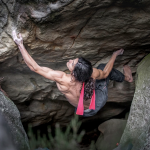 When he had arrived in Yosemite there were just two 5.10s. By the time he left, around 1980, there were so many routes of that grade and miles harder, he had to develop a sub-grading system of a, b, c, and d to tell them apart. 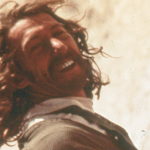 Standout lines of his from his prime included Freestone, Wheat Thin, Outer Limits (Yosemite’s first rappel-bolted route, in 1971), Butterfingers. 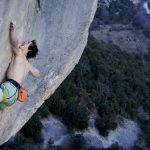 When he felt like he was too old to free climb at a world-class level, Bridwell grabbed iron and banged out the hardest walls in the world. The first one-day ascent of the Nose, with John Long (pictured) and Billy Westbay, in 1975. Fidelman remembers meeting Bridwell in 1974. “I was 16,” he says. “I ran into Largo [John Long] in the parking lot. He asked me if I had any dope, and led me to a tent in the back of Camp 4. “Jim was inside, they both proceeded to smoke ALL of my weed, that’s how I met JB, I was awed to meet my hero. Jim was a father figure to all of us … I went climbing with him shortly after we met. I struggled to lead a pitch and got frustrated and embarrassed. Bridwell asked me to sit with him on the ledge, he told me that it wasn’t important to him how hard his friends climbed. He was a hippie, but not in the traditional sense of say, Oddball in Kelly’s Heroes. He was anti-establishment, but could fit in when he needed to. In Yosemite for the long haul, Bridwell founded YOSAR with John Dill, a “true patriot,” in 1970. He scraped by, drawing the occasional wage by saving a life or recovering a body and “canning,” rummaging through trash for bottles and cans for their redemption deposits. He didn’t need much. Camping was free. Food was “scarfed” from tourist leftovers in the cafeteria, and smokes were “damps,” discarded cigarette butts with a few puffs left. Later, when fame caught him, he would be sponsored by Camel cigarettes. Driven by his background in athletics, Bridwell erected the outdoor gym by the Columbia boulder and trained. Climbers still work out there. When Bridwell wasn’t in the Valley he made it as a ski patroller at Squaw Valley and a climbing guide in the Tetons, a duty he considered as lowly as Mozart teaching the kazoo. He wrote books and articles, gave slideshows and did stunt camera work, rigging and consulting for Hollywood, notably on Cliffhanger. Bridwell’s father, a WWII pilot who later flew for Pan Am, would have preferred that Jim follow his lead. He did, for a time, intending to put in two years at college then join the military, get his wings and move on to the private sector. Offered a full-ride scholarship to Purdue, he instead went to San Jose for its track program and majored in psychology. “There were lots of crazy people so it would be easy to find work if you could handle being with crazy people,” he wrote in an unpublished article for Rock and Ice. When the Vietnam war flared up, Bridwell cooled on his military ambitions. He decided, “not to go to war and kill other humans at the dictate of a specious government,” and dropped out and said he later dodged the draft. In 1964, inspired by Maestri’s (now debunked) ascent of Cerro Torre, Bridwell dedicated himself to achieving a singular goal: to climb Cerro Torre himself. With that pot of gold in mind, Bridwell climbed in Yosemite until, as Long wrote, “Yosemite and Bridwell were synonymous.” In 1979 Bridwell did climb Cerro Torre, via the Compressor Route in just 36 hours, and arguably made the first ascent of the route itself—Maestri hadn’t bothered to climb the summit snowcap, and Bridwell had had to drill rivets up the final summit headwall, implying that Maestri hadn’t even climbed all the rock. Bridwell’s ascent of Cerro Torre, with Steve Brewer, established him at the forefront of alpinism, an achievement most remarkable because he was a fledgling alpinist who had hardly worn crampons at that point..
Bridwell, with Steve Brewer, made the first alpine ascent of the Compressor Route on Cerro Torre, in 1979. 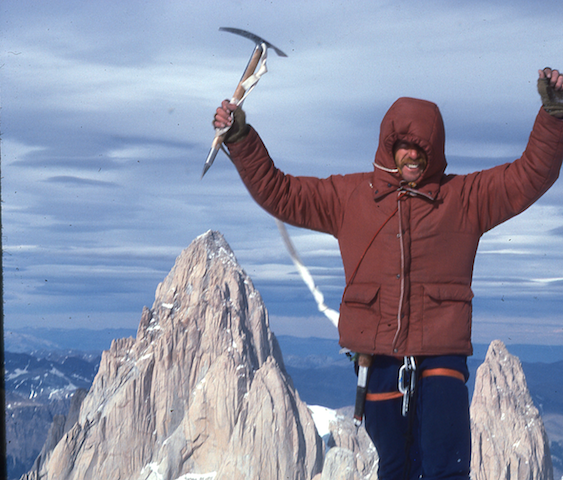 Arguably, this was the route’s first ascent, as Cesare Maestri never stepped foot on Cerro Torre’s summit. 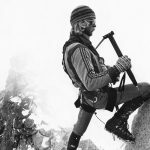 Combining his brand of forward-thinking rock climbing with his zest for alpinism, Bridwell quickly made first ascents of the Northwest Face of Kichatna Spire (1979) and the East Face of the Moose’s Tooth (1981), both in Alaska. Bradford Washburn had called the climb of Moose’s Tooth the “last great problem in Alaska,” but Bridwell, after solving the 5,000-foot puzzle with Dance of the Woo-Li Masters, returned to add another line, and, still unsatisfied, returned at age 55 to straighten the dogleg start to his original route. Famously, on the first ascent of Kichatna, Bridwell bivied in a garbage bag, a hole poked for venting cigarette smoke. John Long notes that Bridwell’s grit as much as his technical skills got him through spots that would have turned anyone else to clay. 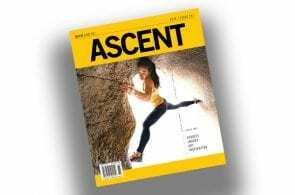 On the first ascent of the Bob Locke Memorial Buttress on the South Face of Watkins, in 1978, done with Kauk and Kim Schmitz, Long remembers a baking, withering heat that lasted for days. Back in Camp 4, tales of Bridwell’s deeds hung like campfire smoke. There was the story of the first traverse of Borneo, a 1,000-mile 43-day trek with Long and Jim Slade. During that leech-infested Equatorial march Bridwell got a Dayak tattoo from a village chief, ate roasted lizard and became host to an intestinal parasite that once he got home had grown to the size of a hotdog. When the worm worked its way out, Bridwell chopped it up and grilled it, or so the tale goes. In 1986, Rolling Stone profiled Bridwell in “Give Him Enough Rope,” by Trip Gabriel. The article wasn’t flattering. Bridwell came off as often unemployed, struggling to care for his wife Peggy and son Layton, and too broke to get his teeth, which had been knocked out by rockfall, fixed. 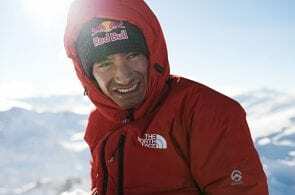 Bridwell, who famously used recreational substances, “equipment, necessary to unfold the mysteries,” he later said, was reported to have taken LSD at the base of Cerro Torre, causing his partners, John Bachar and Mike Graham, to abandon the climb, which he subsequently did with Brewer. 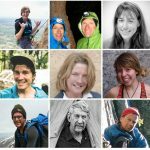 Bridwell said the Cerro Torre account wasn’t accurate, but that he had enjoyed “hypothropic agents,” just not that time, and never while climbing. The Urantia Book was another fundament. Said to have been written by celestial beings, The Urantia Book is a bible of sorts explaining the creations, God and the progression of beings including humans, angels and a paradise where God resides within a billion perfect worlds. At one chance encounter I had with Bridwell he had a copy of the book underarm. It had been given to him serendipitously by a passerby in a nameless desert after a car Bridwell was riding in had broken down, gotten stuck or run out of gas, but I don’t remember the details. Bridwell quoted passage after passage, holding the words in awesome reverence. He really believed them and when someone has that sort of magnetic energy about something that seems crazy to you, you start believing it yourself. One verse stuck out to him and he pulled me over to a table. Plopping down the 2,097-page book he turned to the passage as quickly as if it had been bookmarked. He tapped the lines with his index finger. The words spoke of a slippery topic, about human corruption, namely politics, and the path to enlightenment. After Bridwell had allowed me a moment to digest it, he told me—he didn’t ask—that I didn’t believe in God. “No one who ever did anything ever does,” he said. Among various climbing topics, Bridwell wrote about the formation of YOSAR and being a penniless park bum, but he ranged wider, penning a 19,000-word treatise on his politics (very conservative, oddly), the genesis of planet Earth, evolution and the fate of man, although to fairly summarize the latter would take about 19,000 words. You could say that he had written a prophecy about things he had seen, not that more far-fetched than the lines he’d imagined on the rock. Things that were invisible to everyone else. So much for measuring The Bird. 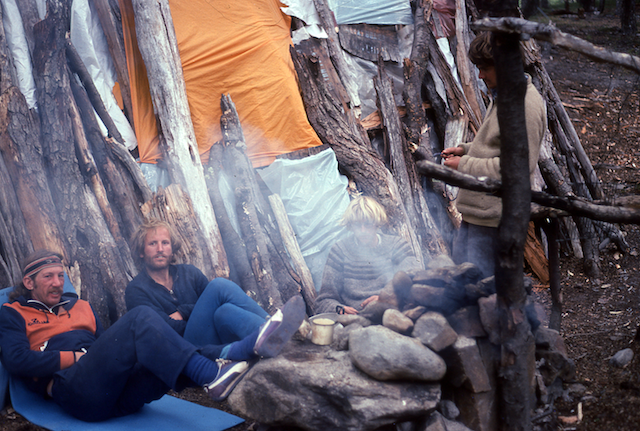 Outside the ramshackle shelter dubbed “Campo Bridwell,” the unofficial basecamp for Cerro Torre, around 1987. Park officials dismantled the structure in 2006. To aid Jim Bridwell’s family with outstanding medical expenses, please visit here.